I finally have a dressing room! Kick up those Heels!!! I'm just loving the new space! Here is that antique crate I talked about in my last post now looking a bit more fabulous with some high heels! Can you believe this thing holds 17 pairs of shoes?!? It is so cute and serves a very big purpose for shoe storage! Love it! I love the way the crate also compliments the DIY vintage inspired crate shelving Alex and I made (sitting just to the left behind the Ikea mirror). Here is a close up of the faux sheepskin rugs I picked up at Ikea. My toes sure love them in the morning when the floors are a bit chilly! Thankfully Sadie is finally leaving them alone too! I think the addition of the Stave mirror from Ikea has proven to be way worth the purchase! I love using the stool and mirror when I am getting ready in the morning. My antique dressform still amazes me! Best way to store/display my necklaces and belts! Swoon! Vintage feel with fashion and shoes... Sigh, I am so in love! Remember back in November (holy moly, can you believe we first started this process in November?!?) 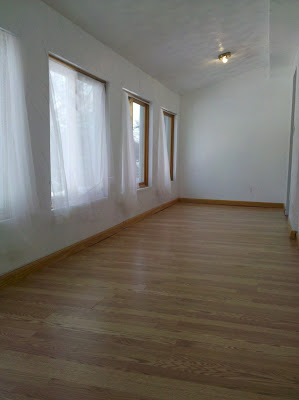 we asked what the heck we should do with this room? 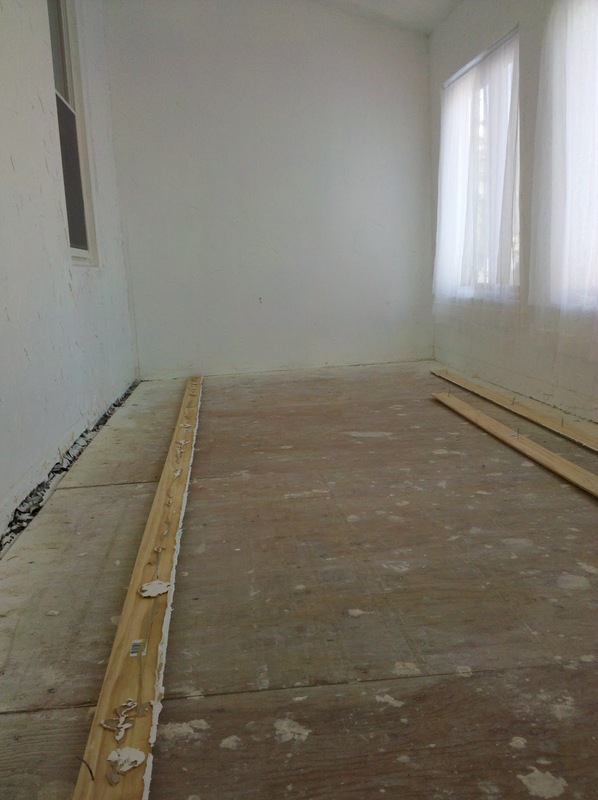 This is what the room was looking like back then, icky carpet and NO personality! The majority of the comments we got said we should be turning the space into a closet, sitting room, or divide the space. We obviously decided on all the above to suit our needs. Check out the original plan and inspiration here! Alex got to work ripping out the carpet since we knew that ugly stuff had to go! 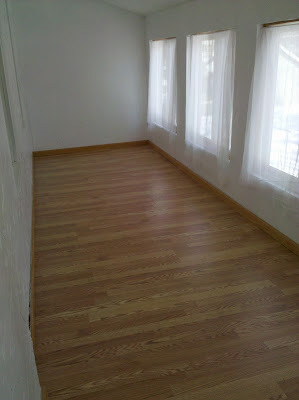 He then installed some laminate wood flooring, sooooo much better! This part was the most expensive of our redo of course, you can check out that post for all the steps. After adding some window treatments, a huge failure, finding the right garment rack, lots of spray painting, hanging a vintage window, making some DIY vintage crates, shopping for accessories, a DIY sign, and a DIY crate shelving unit here we are!!! Phew! Thank goodness I don't have to deal with this anymore! Alex happily took over both closets in our master. This is a lot more fun to hang around in, not to mention things are way easier to find! We still have the other half to deal with. 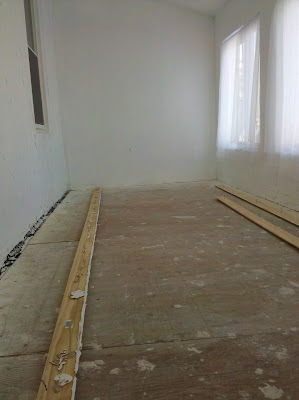 Remember, this room is right off our master bedroom. The dressing room/ sitting area is the perfect idea to sort of create a Master Suite. Our plan is to make a TV sitting room on the other end. If all turns out right, I just may never leave this space! A dressing room and TV!?!? Talk about the perfect place for a gal to go relax in! We'll be posting about this half soon! For the all the posts on this space check out the Upstairs Spare Room Redo label.